sold 605 units last month, registering a 13.9 per cent increase year-on-year (y-o-y). Sales demand is relatively healthy considering no new projects were launched last month and the traditional lull period for buying activities during the year-end holidays. 101 private homes were released, 100 of which were from the existing launch at Affinity at Serangoon. 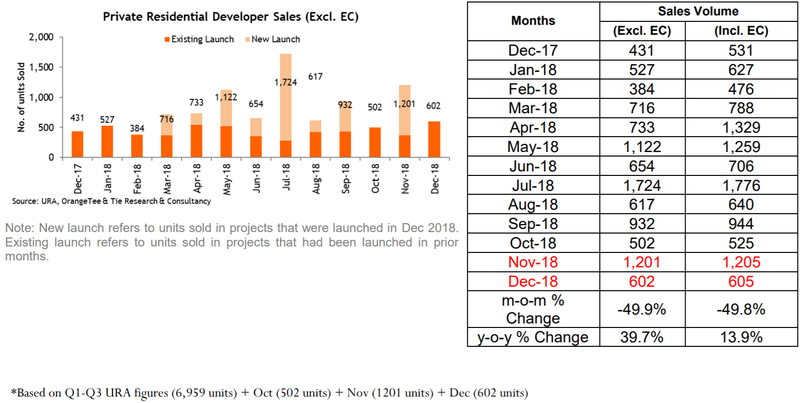 December also marks the lowest number of units launched in a month last year. Sales at some existing launches such as Parc Esta (160 units sold) and Whistler Grand (128 units) continued to see robust demand last month. Double-digit sales were also registered for projects like Riverfront Residences, Park Colonial, Stirling Residences, The Tapestry, Affinity at Serangoon, Belgravia Green and Parc Botannia. Developers’ home sales tally for the whole of 2018 is expected to reach about 9,264 units* (excluding ECs), which is within our earlier projection of between 9,000 and 10,000 units. The total new sales volume for 2018 is 12.3 per cent lower than that of 2017 but higher than in 2014, 2015 and 2016. 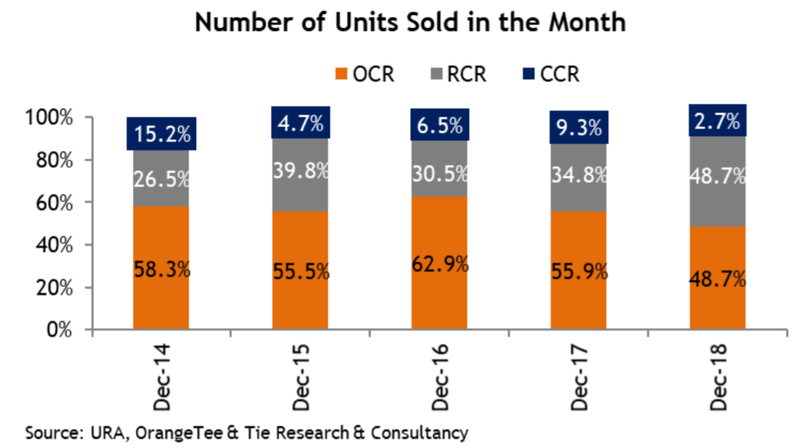 About 40 per cent of new sales were transacted in the last five months of last year, indicating that sales demand is ‘encouraging’ given the onslaught of market challenges i.e. new cooling measures, more curbs on shoebox units being built in certain locations, rising interest rates, stock market fluctuations and rising trade tensions between the US and China. While the macro-economic conditions remain uncertain, Singapore’s economic growth and job market are expected to remain firm this year. The ongoing sales momentum at several new projects may indicate that the property market could be reaching equilibrium soon as prices are stabilising and more buyers are streaming back. A bonanza of between 19,000 and 21,000 new homes from over 60 new projects are expected to be launched-ready this year. We anticipate that the current buying momentum will continue and the supply-led demand may see new sales reaching 10,000 to 11,000 units for 2019. Many projects are expected to be launched after the Chinese New Year including The Florence Residences and Treasure @ Tampines. Copyright © OrangeTee & Tie Pte Ltd. All rights reserved.